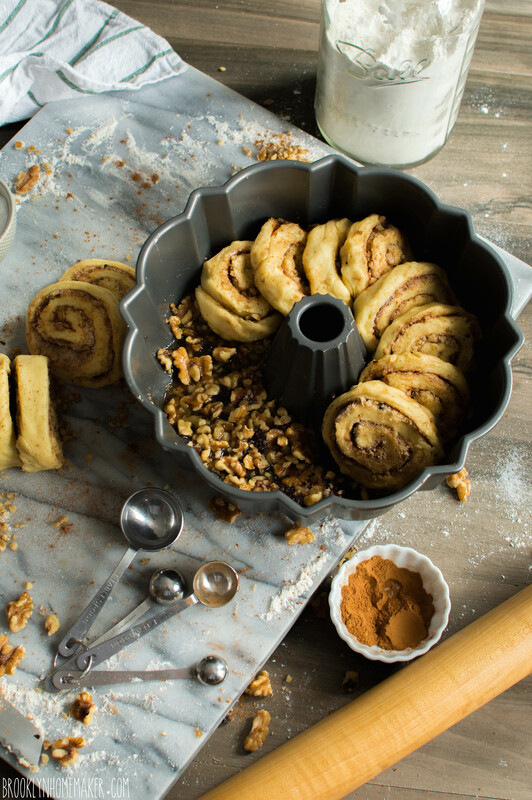 Another day, another bundt. That’s what I always say. Who am I kidding? I’ve never actually said that. It does sometimes feel that way though, and this will be the 20th bundt cake I’ve baked and photographed and eaten since I started Brooklyn Homemaker. 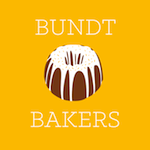 Having joined a bundt baking blogging group has certainly kept my oven warm and my belly full! Over the months (or is it years already? ), I’ve done my best to keep things interesting and avoid bundt monotony. The creative themes the bundt bakers come up with have always provided me with fun and interesting challenges month after month. Every once in a while though, you really need to do something you’ve never done before, something totally different and unique, to give yourself an inspirational kick in the pants. 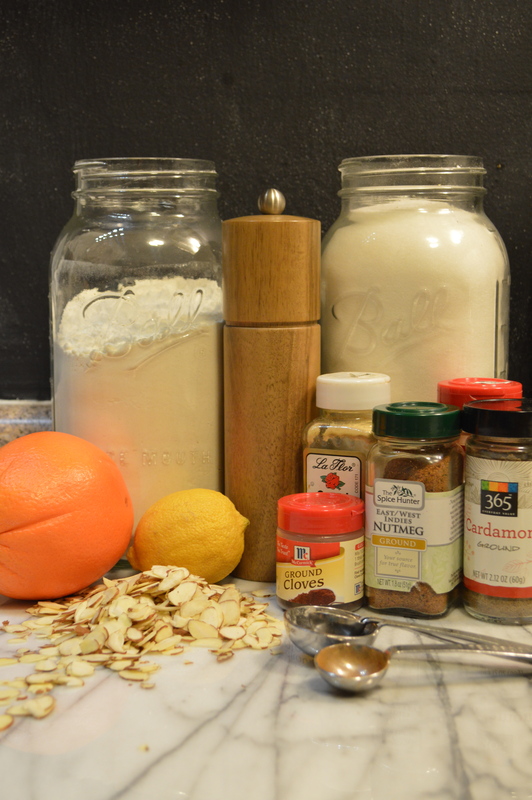 This month’s theme, chosen by Lauren of Sew you Think you Can Cook, is cinnamon. Warm, sweet, homey cinnamon! Who doesn’t love cinnamon, especially during the dark and dreary days of winter? Thanks Lauren! 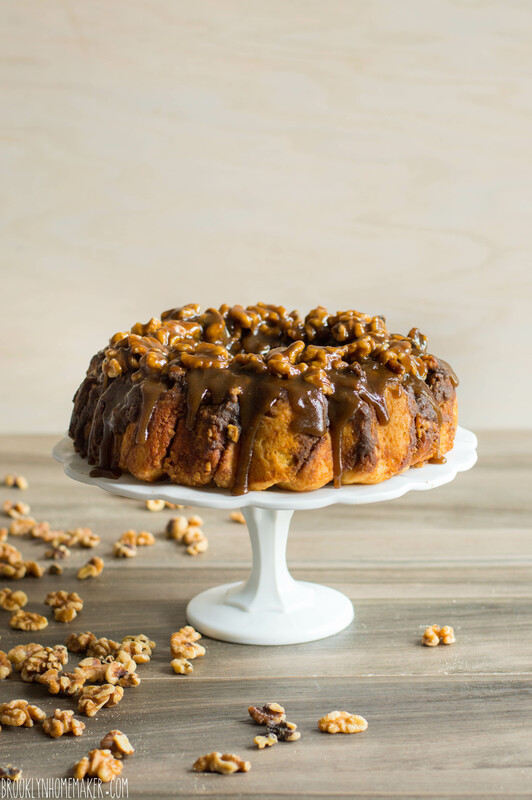 I’ve been looking forward to baking this month’s bundt for a while now, but when it came to decide what to actually put in the oven, I was stumped! The problem was that every idea I came up with just didn’t feel very exciting to me. I was certain that they’d all be totally delicious, but I couldn’t think of anything I haven’t seen before. 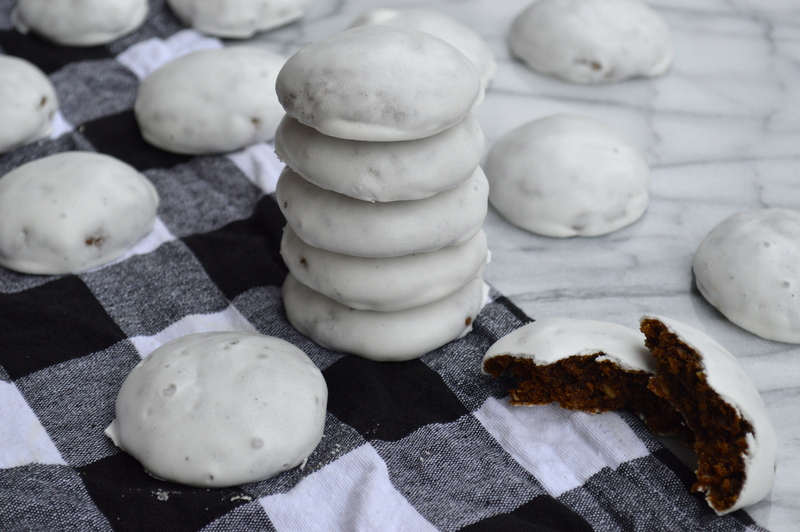 There’s something to be said for simplicity and tradition, and there’s nothing better than a buttermilk spice cake in my book, but I really wanted to do something original this month. After much hemming and hawing I decided to consult one of the new (old) cookbooks Russell gave me for Christmas. With my fingers crossed I reached for the United Sates Regional Cook Book by Edith Berolzheimer and hoped a recipe from 1939 would catch my eye. 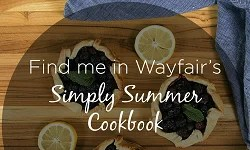 The contents are broken up into 11 culinary regions of the US, ranging from New England to Creole cooking, and there’s even a special chapter on “Cosmopolitan American” cooking. One thing that really struck me was that there are three separate chapters on culinary regions labeled “Dutch”. I’d heard of the Pennsylvania Dutch before, but the other two groups were unfamiliar to me. Another odd thing was that one of the regions, the Michigan Dutch, featured recipes from Holland, while the other two chapters featured German recipes. Did you know that the name “Pennsylvania Dutch” actually has nothing to do with Holland or the Netherlands? In the U.S., these groups are called “Dutch” because their American neighbors misunderstood “Deutschland”, the German name for Germany, and mistakenly thought the people settling these regions were Dutch rather than German. The name stuck and they’ve been called the Pennsylvania Dutch ever since. I was aware that there was a large German population in Wisconsin too, but I had no idea that they were also called the “Wisconsin Dutch” in the same way as the group in Pennsylvania. After flipping through the book I also noticed that each of the German “Dutch” section had their own separate recipes for “Schnecken”. 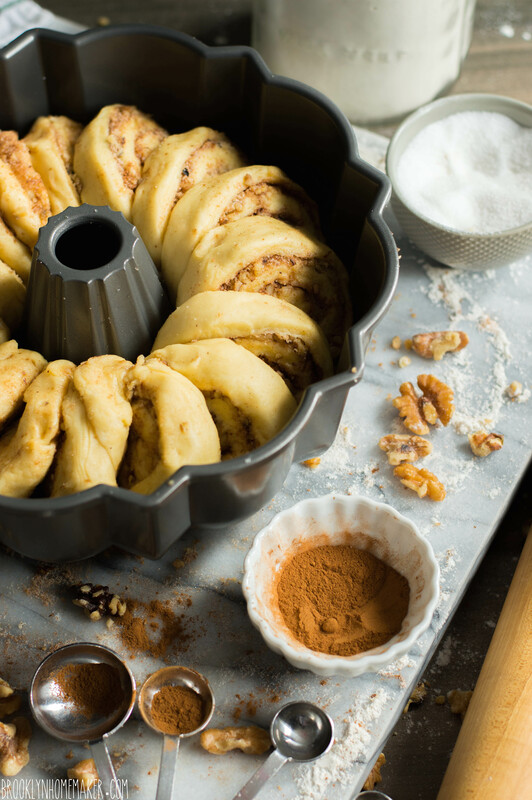 If you’re not familiar, schnecken is basically a German version of a sticky bun or cinnamon roll. The word schnecken means “snail” in German, and the pastry’s name is inspired by the swirled pattern of a snail’s shell. The strange thing to me was how different each recipe was from one another. The Pennsylvania Dutch version seemed pretty straight forward and similar to other cinnamon roll recipes, but the Wisconsin Dutch version was made with a much richer dough and was baked in a loaf pan rather than a traditional round or rectangular cake pan. The Wisconsin recipe also had nuts, brown sugar, and butter added to the bottom of the pan, so that when the schnecken is turned out you’d have a pull-apart loaf topped with it’s own drippy buttery sauce. 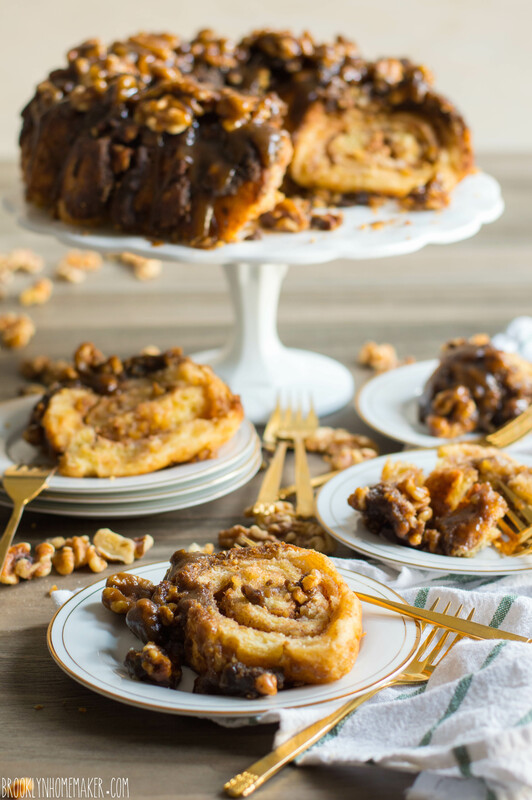 I’ve never seen cinnamon rolls baked this way but it seems rather similar to monkey bread in my mind. I figured that if this recipe could be baked in a loaf, why couldn’t it be baked in a bundt pan? 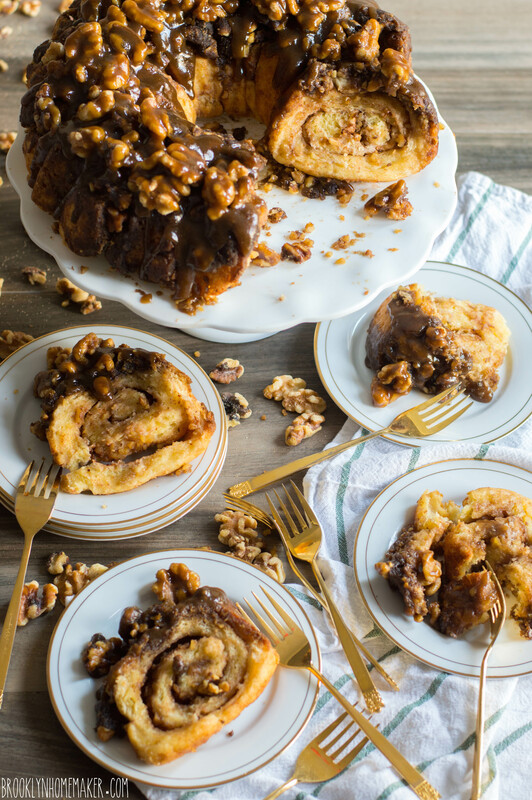 A round loaf of pull-apart cinnamon rolls, dripping with their own buttery brown sugar sauce. What could be better than that? The Wisconsin version didn’t actually call for cinnamon, but the Pennsylvania recipe did so I just went for it. I also swapped walnuts for the pecans and almonds called for in the original recipe. 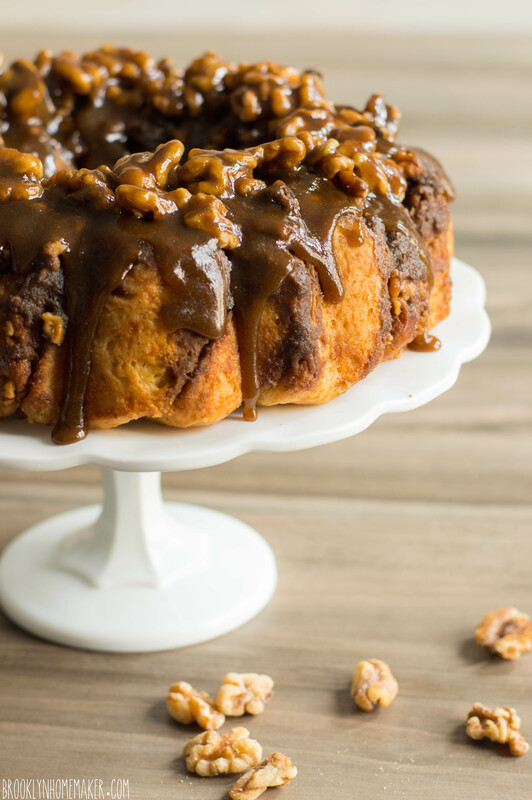 I’ve been on a bit of a walnut kick lately and I absolutely love their bitter earthiness when paired with rich sweet recipes like this one. The resulting cake is super fun to eat as you just pull each roll off as you go, no knife required. It’s rich and buttery and dripping with with butter and brown sugar. 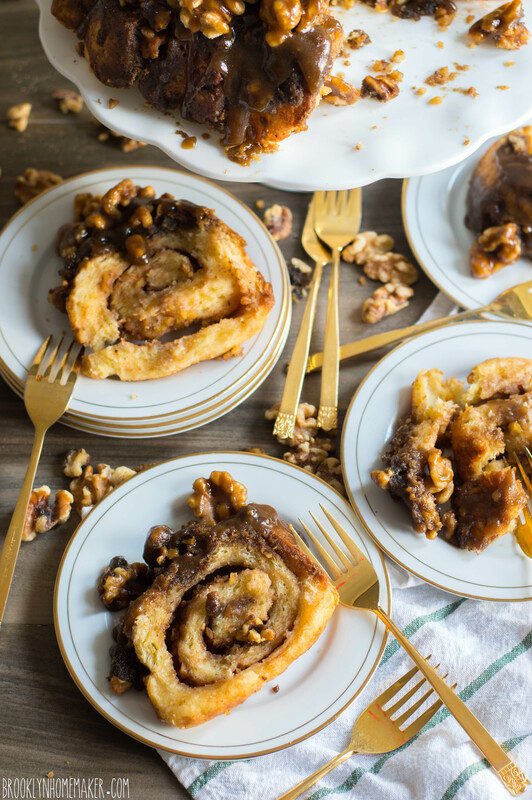 The cinnamon adds a lovely homey warmth and the walnuts provide an earthy bitterness that compliments perfectly with the sweetness of the sauce and richness of the pastry. I brought the cake to work with me for a staff meeting and it was absolutely devoured! This cake should probably keep for a few days, but to be honest I wouldn’t know! It’s definitely best eaten warm. This is a yeast raised recipe, but to my surprise it didn’t call for any water or even milk, only heavy cream, egg yolks, and lots of butter. Lots and lots of butter. The resulting dough is extremely rich, and when eaten cold it had a slight greasiness. I also think that it’d be better baked at a slightly lower temperature as it seemed slightly overcooked, with an almost fried feeling, on the outermost edges. In the recipe below I’ve changed it from cream to milk and lowered the temperature from 375 to 350. This still will make an undoubtably rich and decadent cake and I’m fully confident that you won’t miss all that heavy cream. I did make notes if you want to make this in it’s original 1939 form, but I’m completely rewriting the recipe instructions to make them easier to understand. Whisk yeast into lukewarm (not hot) milk. 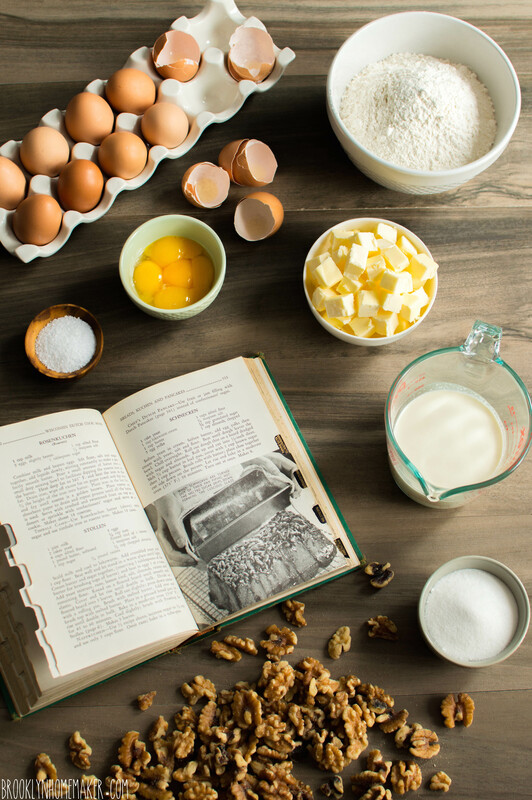 In the bowl of an electric mixer with a paddle attachment, mix the softened butter and egg yolks until well combined. Mix in milk, salt, and flour. Switch to a dough hook and mix until the dough comes together and leaves the sides of the bowl. Cover with a damp towel and let rise for an hour to an hour and a half, or until doubled in size. You can also cover with plastic wrap and refrigerate overnight. 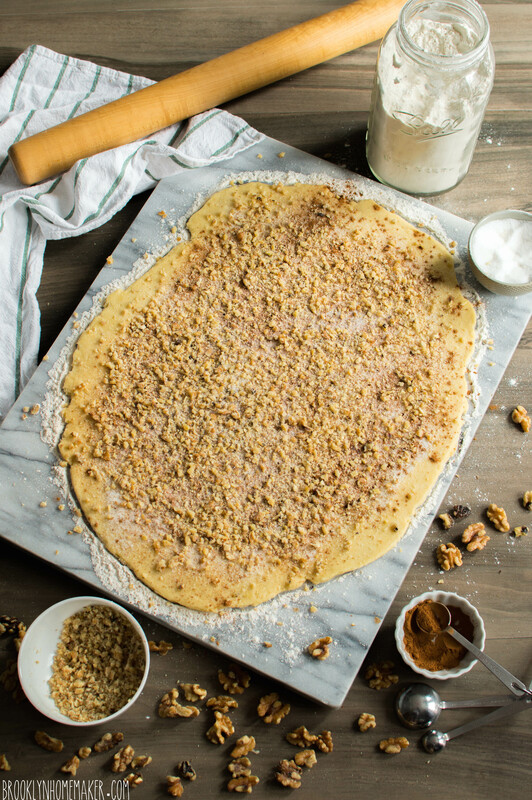 On a lightly floured board, roll the dough out into a rectangle. Mine was about 18″x12″, but the original recipe just said to roll it “thin”. Sprinkle evenly with sugar, chopped walnuts, and cinnamon. Roll up and slice into 12 to 16 even slices using a sharp serrated knife with a gentle sawing motion. Pour melted butter into the bottom of a 10 to 12 cup bundt pan, reserving 2 tablespoons for later use. Tilt the pan to coat the sides in melted butter, but let most of it remain in the bottom of the pan. Sprinkle nuts in an even layer, and top with brown sugar in another even layer. 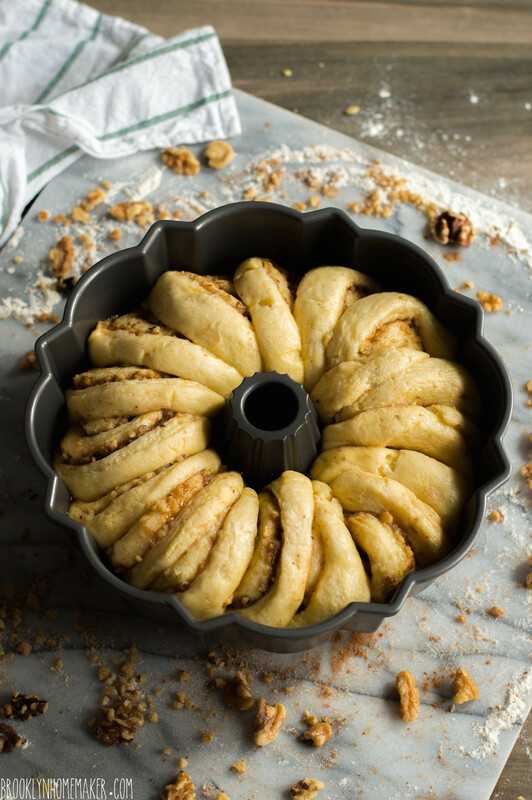 Arrange rolls, at a slight angle, evenly around the pan atop the nuts and sugar. Brush with remaining butter. Cover with a damp towel and let rise for an hour to an hour and a half, or until doubled in size. Preheat oven to 350. Bake until golden brown on top and a toothpick comes out clean, about 30 minutes. Turn out onto a serving plate or cake stand immediately. Do not leave in the pan or the sauce will stick. Serve warm. *note: The original recipe called for cake yeast, but I couldn’t find it. Dry yeast worked out just fine. **note: The original recipe called for heavy cream, but I found that it made the recipe too heavy and rich, with a greasy feeling. Milk will lighten it up a bit but the butter and egg yolks will ensure it’s still plenty rich. 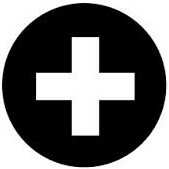 My family background is mostly German. Both sides of my family have German origins, but my paternal grandfather is the most recent to have moved to the US, having immigrated after WWII. I remember when I was younger he would spend hours on the phone speaking German to his brothers and sisters, most of whom all live spread throughout upstate New York. Christmas was always a time when they would send each other gifts that reminded them of home, and that time of year meant my grandparents house would be filled with all kinds of German treats. Grandpa had an ever growing collection of beer steins that his cousins would send him from Germany. When my sisters and I turned 21 we started trying to find his favorite types of German liqueurs (he’s a fan of the sweet stuff) like Kirschwasser and Barenjager. My grandmother never really cared much for German food or cooking, so the German edibles around the house tended to be candies, cookies and cakes. One of his favorites was Stollen, a bready yeasted fruitcake filled with marzipan, candied fruit and nuts, and usually covered in powdered sugar or a thick white glaze. I never really developed a taste for Stollen, but another one of his favorites, Pfeffernusse, I absolutely love. 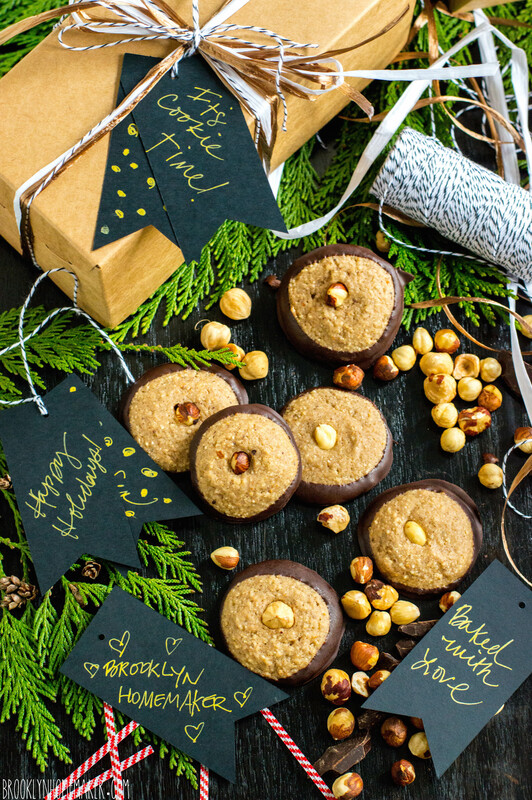 Pfeffernusse, AKA Peppernuts, is a strongly flavored European spice cookie. It’s kind of similar to a strong gingerbread in flavor, but with a bit less ginger, and with finely ground black pepper instead. Pfeffernusse traditionally has some ground or finely chopped nuts in it, along with citrus zest, molasses and brandy. Some say this is an acquired taste, but I just think it’s not what people expect when they pick them up. Either way, this is an amazing underrated cookie that you will love if you give it a chance. 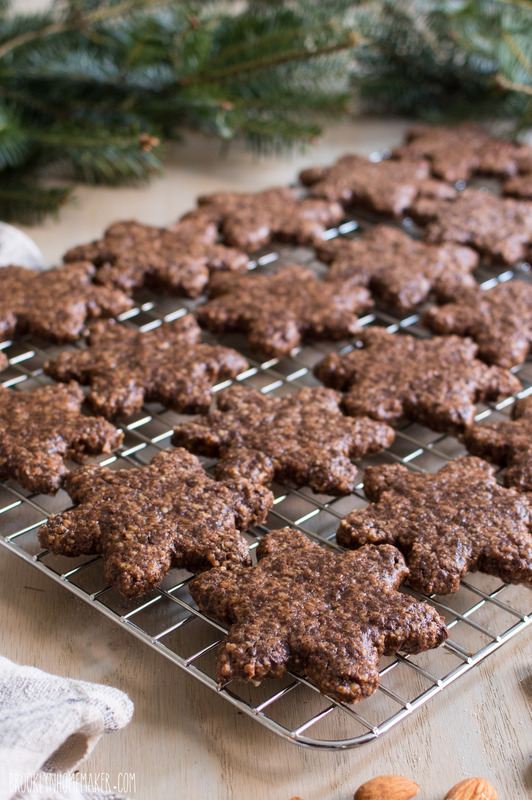 They have a very subtle sweetness with a pleasant old-world holiday spice flavor. They also have a really fun name. Just say it out loud. Pfeffernusse. Pfeffernusse. Pfeffernusse! There are a lot of pfeffernusse recipes out there, but this one is as close to traditional as I could find. A lot of recipes I found didn’t have enough spice, many of them skipped the nuts and citrus, and most omitted the brandy. This recipe, from the Joy of Cooking, is just what I was hoping for. 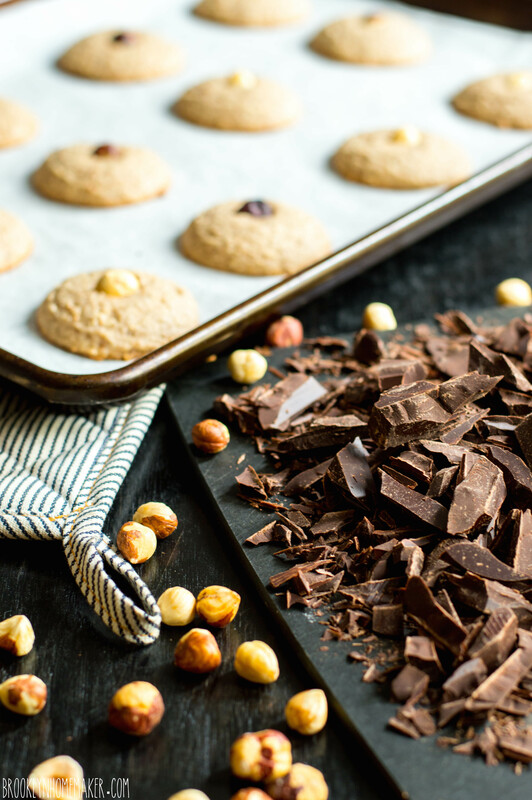 Store bought pfeffernusse can sometimes be a bit dry, but this recipe produces a moist, chewy and cakey cookie. It’s got a very respectable amount of spice, the molasses and brandy flavors really come through with the citrus close behind, and the soft almonds give it a bit of texture. 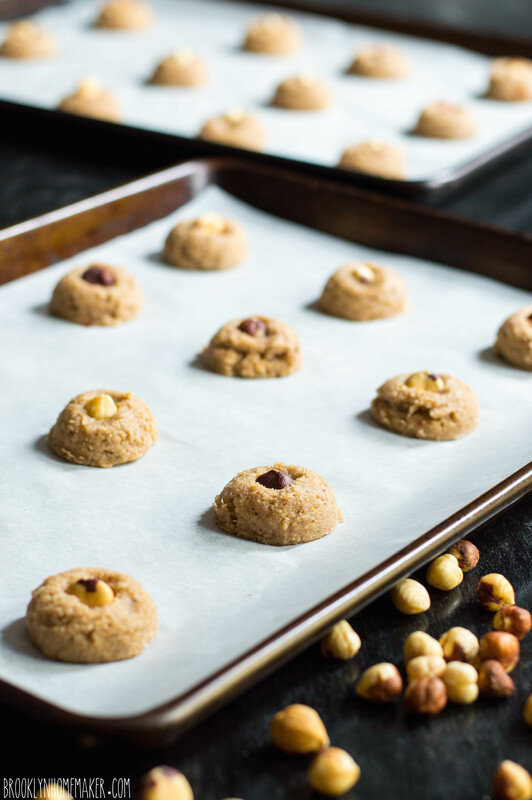 The list of ingredients in this recipe is substantial, with many different spices going into this cookie to give it it’s distinctive flavor. One spice you might not have in your cabinet is cardamom, but I implore you to try to find it. It has an exotic floral citrus flavor and is slightly reminiscent of cinnamon & ginger. It goes really well in spice cakes and similar desserts, especially desserts with apples. I love to add it to apple pie, and when I used to make apple butter I considered it my secret ingredient. 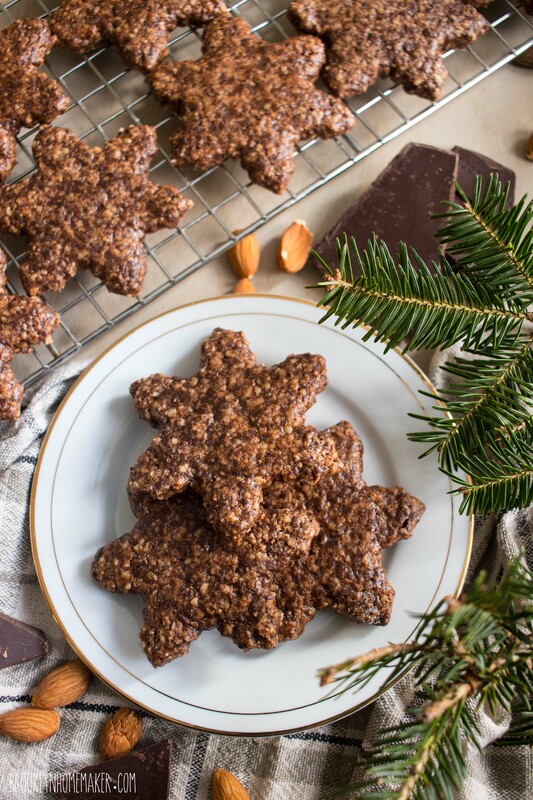 As for the brandy in this recipe, it mostly bakes off in the oven, but imparts a great flavor and adds moisture, so I definitely wouldn’t skip it. If you don’t have brandy and don’t want to buy it to use a few tablespoons, you could sub it with another alcohol like rum or bourbon. Orange liqueur could be nice too but might make the cookies too sweet so you might want to reduce the sugar a tablespoon or two. I wouldn’t use Irish or Scotch whiskey because the flavor can be too strong or even smoky. Most Pfeffernusse recipes I found called for them to be rolled warm through confectioners sugar. 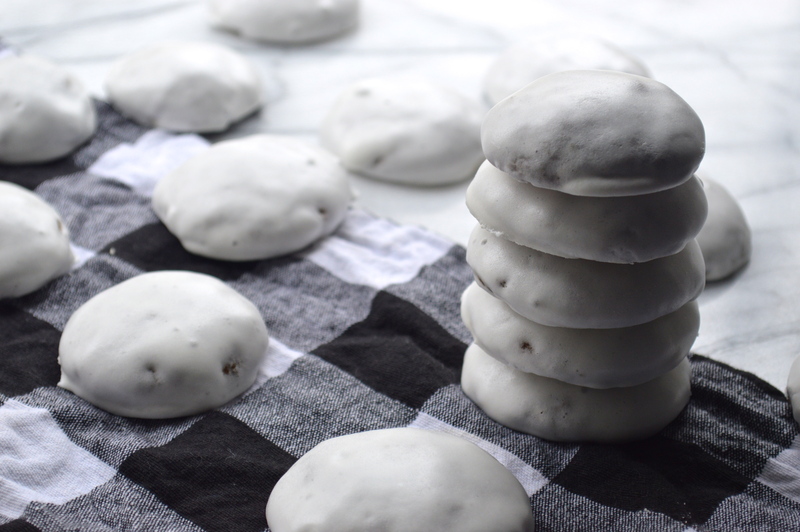 I’ve had them this way and they’re delicious, but I remember the cookies my grandfather eating when I was young having a stiff white shell of glaze, so that’s what I wanted. After a bit of searching I found what I was after. When you whip this glaze up it resembles marshmallow fluff, but thinner. You basically dip the whole cookie into it, let the excess drip off, and then dry the glaze in the oven while it’s cooling. Once the glaze has hardened you’re good to go. To dip these cookies I attempted to be dainty and polite, using a slotted spoon, but I quickly realized this was a job for clean hands. You’ll have it everywhere, and it’s sticky, but it’s so worth it. 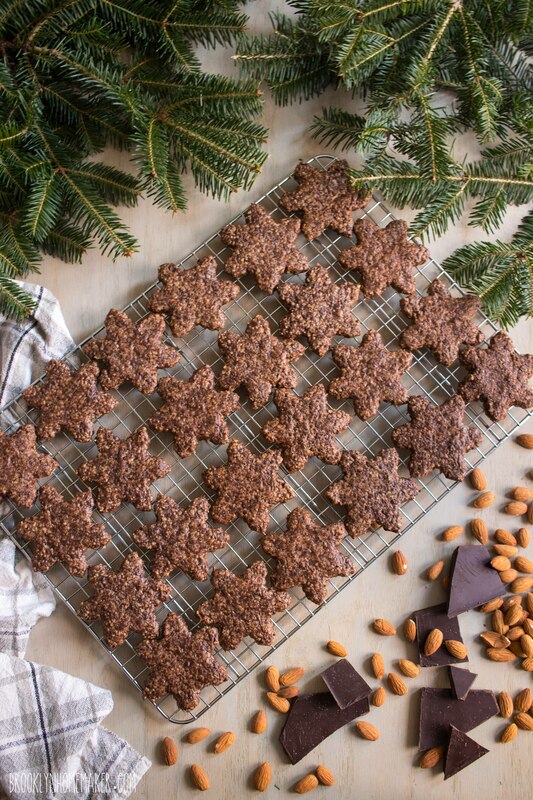 Once all your cookies are dipped you transfer them back to your baking sheet to dry. I used a small offset icing spatula, but a large butter knife should work well too. 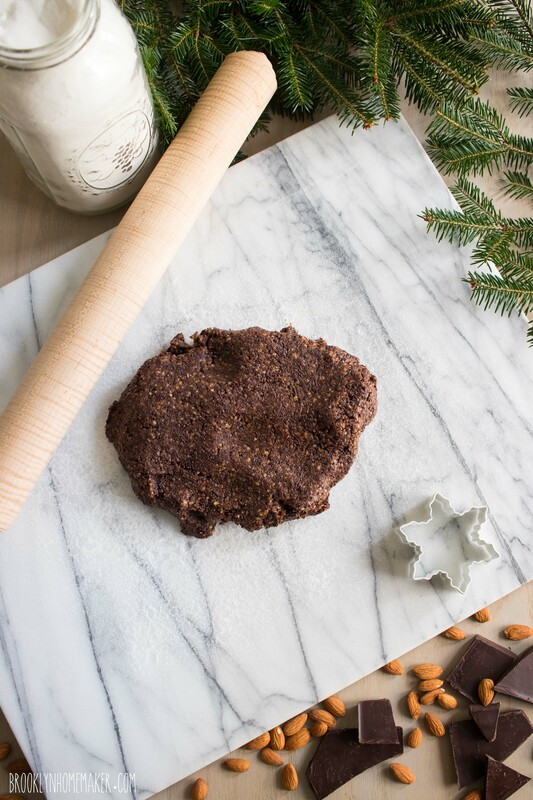 If you’re looking for a new cookie recipe for the holidays, look no further. 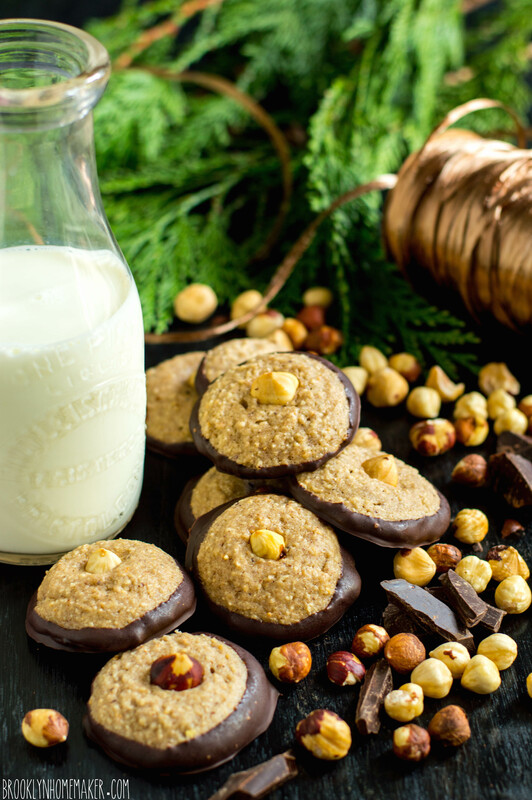 These cookies are said to be a favorite of Kris Kringle’s and they’re about to become one of yours. 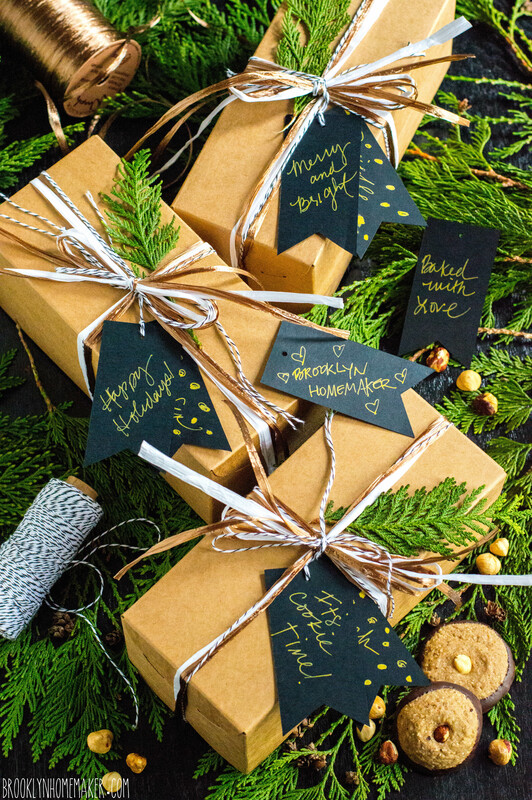 They might be a little unexpected, but most people with a grown up pallet will appreciate this European holiday treat. 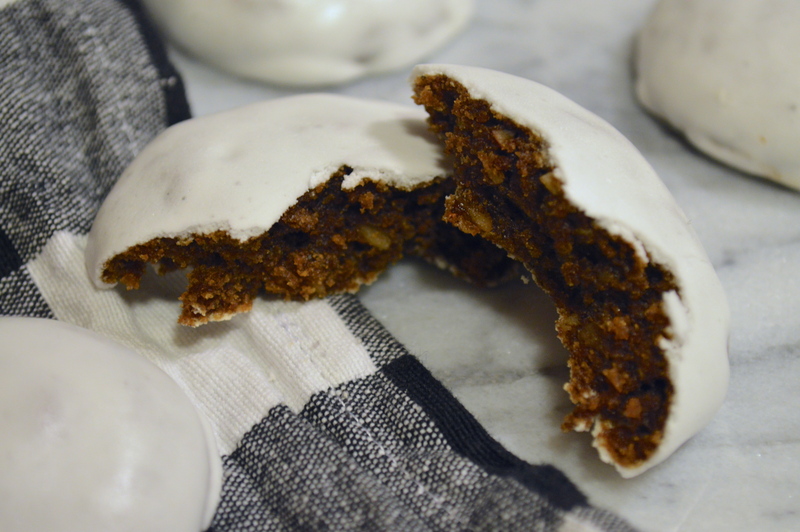 Anyone who enjoys spice cakes and gingerbread will surely fall in love with pfeffernusse. Traditionally they’re a small cookie, about an inch across when baked, but I made mine just slightly larger. 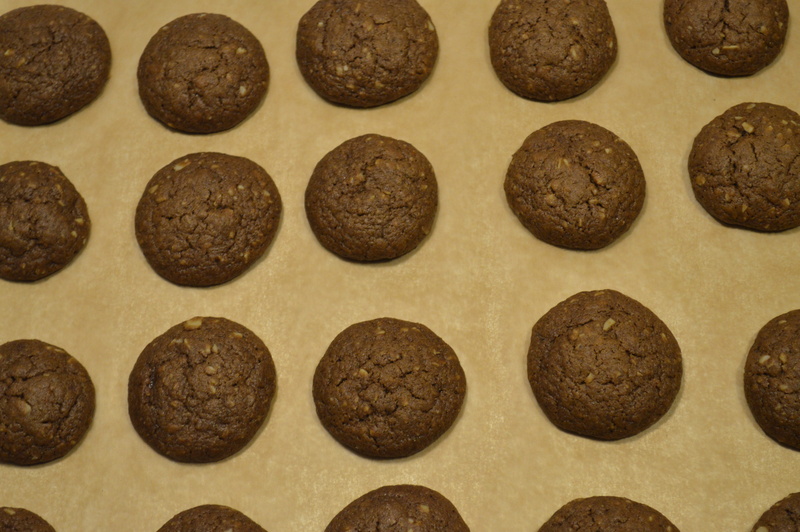 I used a #60 cookie scoop, or about a tablespoon of dough for each cookie. I’d say a more traditional size would be about 2 teaspoons of dough, which would give you a few more finished cookies. 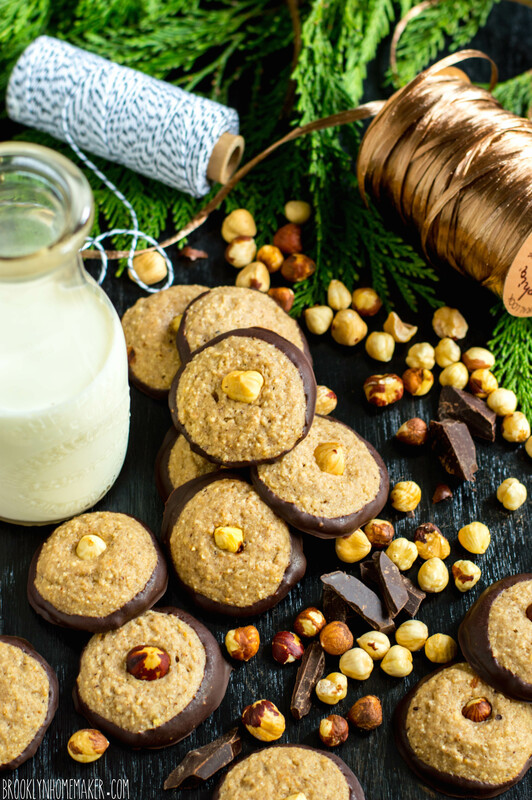 They store and travel really well, so they’re perfect for taking home to family for Christmas, for sharing with friends at a cookie swap party, giving as gifts, or even mailing to the grandparents. They even improve with a few days age, so making ahead is a good idea, and they stay fresh for two weeks or more, so you might want to make extras! Whisk together flour, baking soda, baking powder, and spices in a medium bowl. With an electric mixer beat butter and sugar until very fluffy. Add egg yolk and beat until well combined. Stir in almonds and citrus zests, and scrape bowl. In a small bowl mix the brandy and molasses. Alternate stirring in flour mixture and brandy mixture until combined. Cover and refrigerate for at least 8 hours, up to 2 days, to allow flavors to blend together. 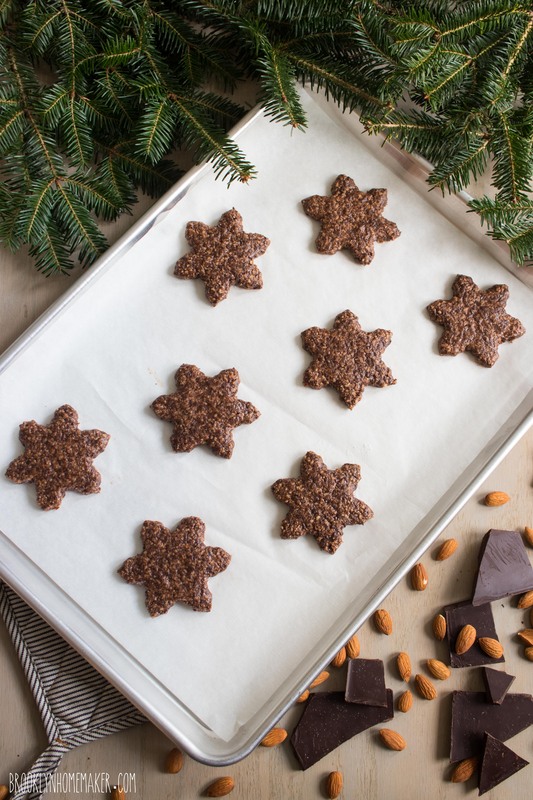 Preheat your oven to 350 degrees and line cookie sheets with parchment paper. 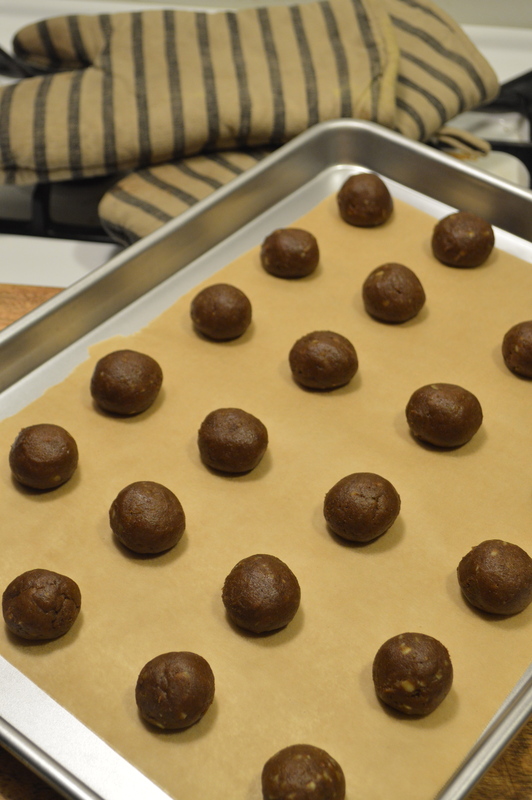 Scoop about a tablespoon of dough, I used a #60 scoop, and roll into a ball in your hands. 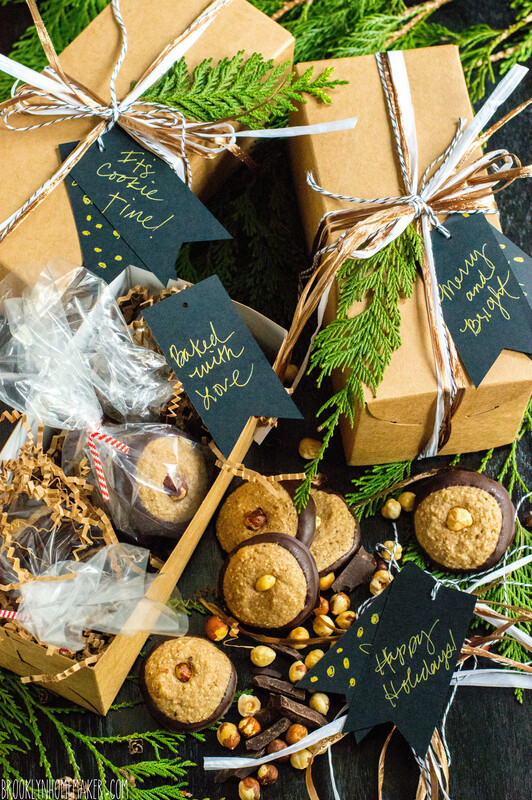 Line up cookies about an inch away from each other on your parchment. Refrigerate for 10 minutes or more, then bake, 1 sheet at a time, for 12-14 minutes or until lightly browned and no longer wet looking on top. Let cool for about 5-10 minutes before dipping in glaze. To make your glaze, whip your egg whites to stiff peaks with an electric mixer. Slowly mix in confectioners sugar, and whip until completely combined with no lumps. 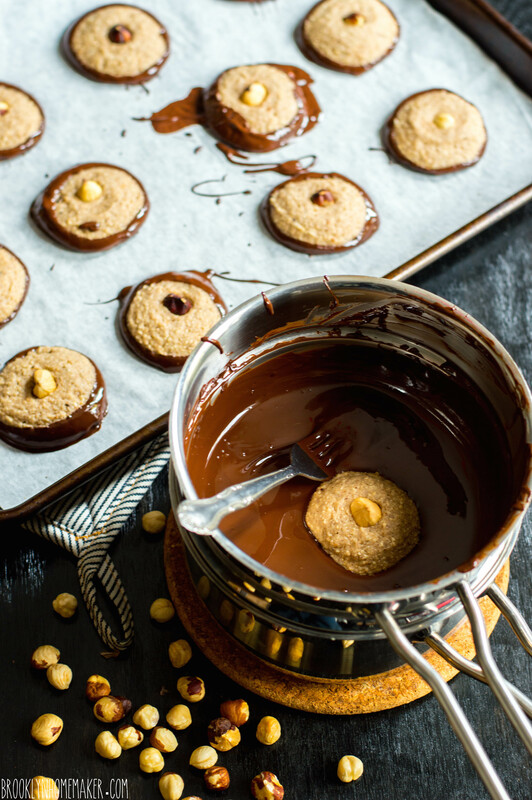 With clean hands, dip your still warm cookies into the glaze and completely cover them. 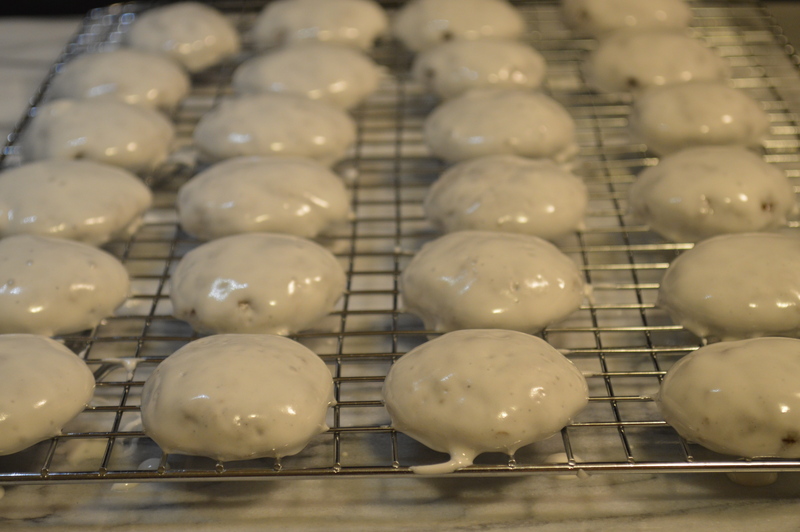 Let glaze drip back into the bowl and transfer cookies to a wire rack to allow any excess glaze to drip off. Once all your cookies are glazed transfer them back to your parchment lined pan and put them back in the still warm oven with the door open just a crack. Let the glaze dry in the oven for 5-10 minutes and transfer the pan to the counter. Let the glaze harden completely, for an hour or more, before serving or storing. 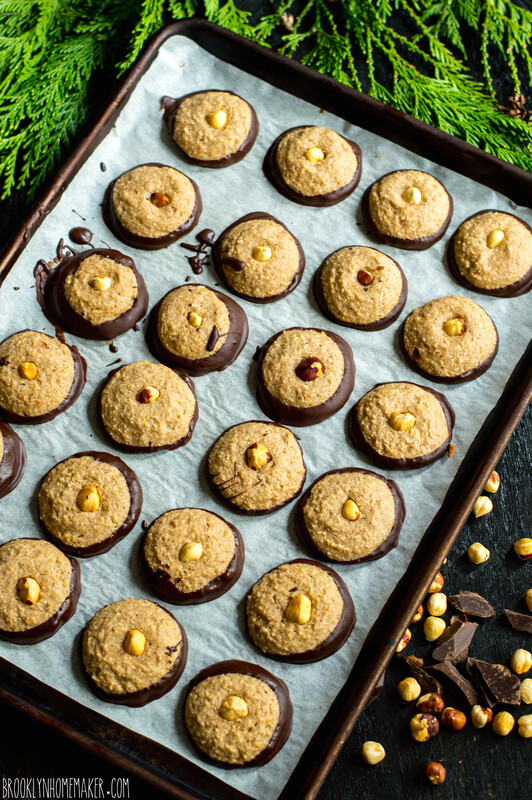 If storing immediately, turn the cookies over and let the bottoms dry for an hour before stacking, and divide layers with parchment or wax paper to avoid sticking.